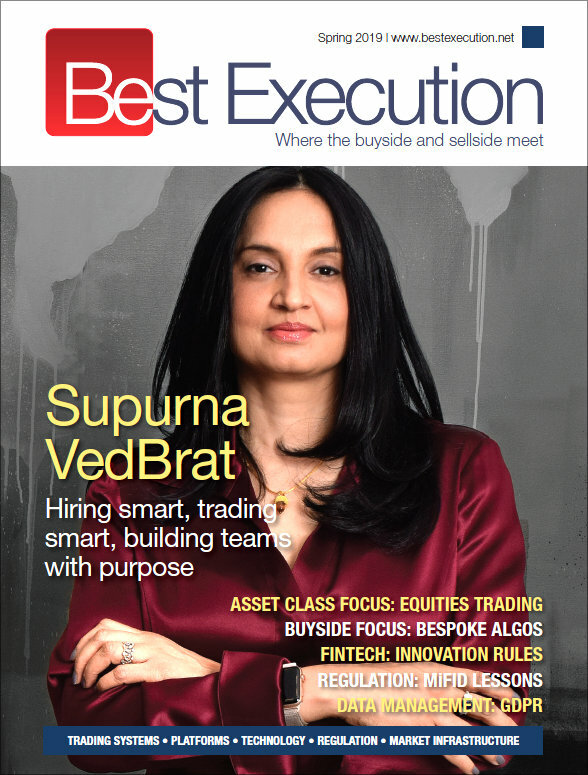 By Scott Bradley, Head of Sales and Marketing, LSE Cash Secondary Markets and Turquoise. We saw some very noticeable changes occurring to order flow being routed into Turquoise Plato™ in Q4 last year as clients were preparing themselves for the anticipated new liquidity landscape. Following what could justifiably be described as a ‘relatively’ smooth transition into a MiFID II environment, we saw a general increase in order size and the subsequent execution size growing on average by an incremental €100,000. This resulted in January posting a record month for Turquoise Plato Block Discovery™, with €9.25 billion traded (+22% on the previous record month). 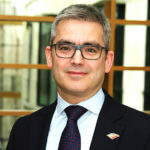 The surprise announcement by ESMA on January 9th of the delay to the implementation of Double Volume Caps (DVCs) due to an incomplete data set also played its part. The new implementation date for the caps arrived on March 12th and instantly Turquoise Plato Block Discovery™ experienced a step change in client routing behaviour with the average execution size in the immediate weeks following DVC implementation increasing a further €150,000 to more than €620,000. This being inclusive of the fact that, where permissible for a security, orders over 25% Large in Scale (LIS) may still be submitted into the service. 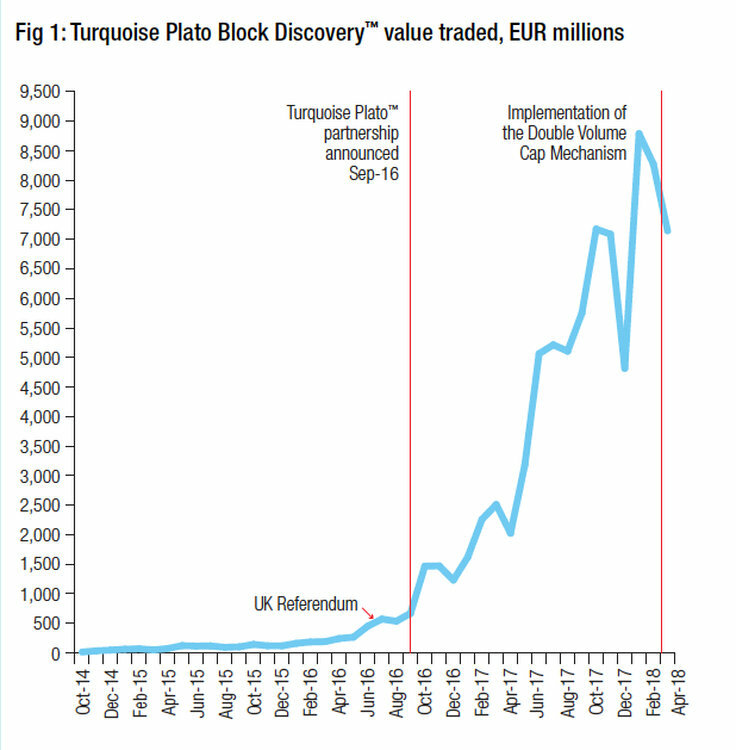 In fact, by value traded, over 85% of executions within Turquoise Plato Block Discovery™ were over 100% LIS, and trade sizes in European blue chip securities increased by 21% in Q1 compared to Q4 last year. 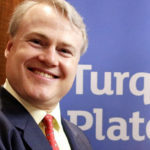 What is also interesting to note is that we have observed that the first half hour of trading is typically the busiest trading interval within the service, which further highlights the importance of Turquoise Plato Block Discovery™ when actively looking for liquidity in order to get your business done in size whilst saving half the spread. 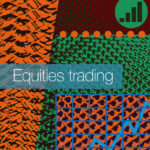 This complements the volume distribution observed by the primary venues where the closing auction accounts for such a significant proportion of the day’s liquidity. 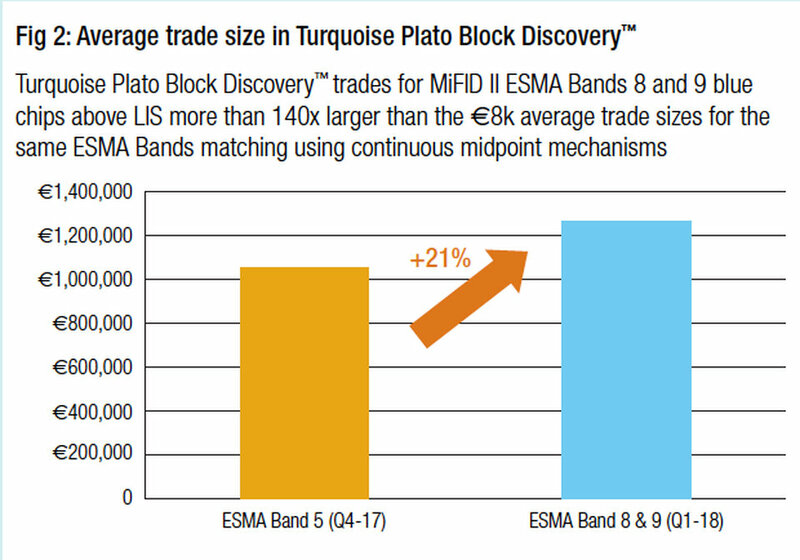 Whilst the use of conditional order venues such as Turquoise Plato Block Discovery™ continues to provide important LIS trading opportunities, the DVC related pre-trade transparency waiver suspensions have led to innovations such as frequent transparent auctions becoming new liquidity destinations within the new MiFID II landscape. Competition for success within these constructs is developing rapidly with first mover advantage currently paying dividends. However, competition leads to innovation and creates choice and with this Turquoise Lit Auctions™ is growing strongly following regulatory approval in Q4 last year. 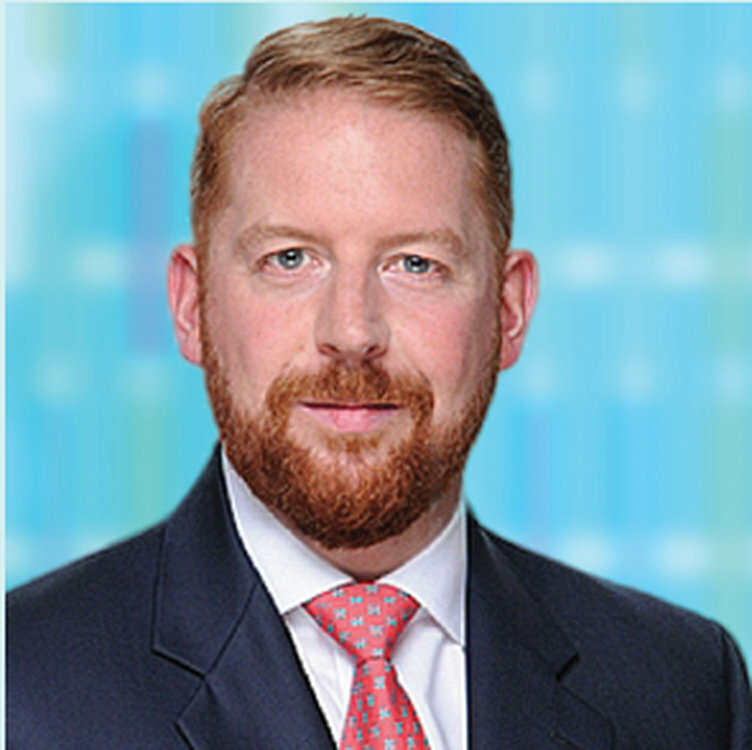 The new book (MIC code TRQA) was introduced following demand from our members who are looking for new liquidity channels and assistance navigating the execution landscape post MiFID II, looking to a trusted partner such as Turquoise with its proven track record for delivering innovation and quality executions. 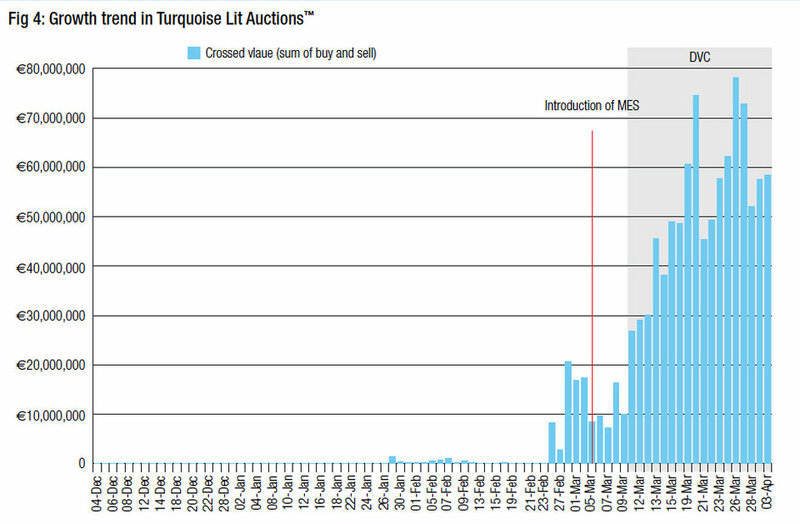 In total, 714 Turquoise instruments were impacted by the Reference Price Waiver suspension following the announced DVCs, so with Turquoise Plato Block Discovery™ successfully providing for above LIS business and Turquoise Lit Auctions™ being a venue to help achieve the best result on a continuous basis for sub LIS business, the very essence of best execution is being acknowledged. Whilst the service was technically launched on 4th December 2017, it has really been since the introduction of a Minimum Execution Size (MES) functionality on 5th March (a week before the DVCs came into effect), that we have seen strong momentum in Turquoise members coming on-board and actively routing on a daily basis, with a doubling of clients and a significant increase in trading activity from that point to end of March. We see further considerable growth just around the corner with each new member participant bringing potential contra liquidity to the book. The matching mechanism of Turquoise Lit Auctions™ determines the auction price as the price within the PBBO which maximises executable volume. The price and quantity can dynamically change during the auction phase up to the point of execution as participants add, remove or amend orders, or as PBBO midpoint changes, with the indicative price and aggregate volume market data message updating in real-time with each change. Members can ‘opt-in’ to member priority matching which means once the Turquoise Lit Auctions™ price and volume is determined, a participant’s orders will first match against their own contra orders before attempting to match against other counterparties, maximising the matching potential with their own firm’s order flow before matching residual with others. Through Q1, ‘self-matching’ has been a reasonably low percentage of total volume traded within Turquoise Lit Auctions™ reducing as further participants join, something which highlights the workflow importance of the service for clients looking to find liquidity through their smart order routing logic. 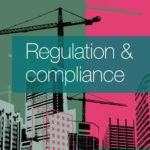 Access to Turquoise Lit Auctions™ (MIC: TRQA) is straightforward and utilises existing Turquoise connections, fundamentally requiring only a change in target MIC code.